Today, my aunt from Regina came to attend a ceremony for my cousin, since she had become of age (attained puberty). This religious sacrement is celebrated in our Tamil community and is known as ritu kalam or chamuthi veedu (in Tamil). When my aunt came, she started to discuss what I was doing and what my career plans were. After the function, I came home and cried. I was upset since I was desperately trying to get into medical school but have not yet received an acceptance letter. My aunt discussed some old friends of mine who were younger than me and told me that they have already established themselves in a professional career such as accounting or dentistry - whereas I was not getting anywhere in life, she (my aunt) was pretty condescending to me. I was depressed the whole day. I kept thinking, is this as far as I will get in my career? Will I ever become a doctor and serve my brothers and sisters of light and in doing so, serve Lord Skanda? I really cried and called Lord Murugan's name - many, many, many, times! Two days after my heart-felt call for help to Lord Skanda, I had a dream. I dreamt that I was again crying in my room. Tears were gushing like a wild river down my cheeks. Suddenly, there appeared a tall dark figure. A vikram stood in front of me. It was black and it looked like Sri Skanda. However, I did not see a Vel or Myol (peacock). I then awoke abruptly. Through His darshan, I felt Lord Skanda speaking to me through my heart and I felt him saying,"Trust in me. Turn to me. Don't worry. I'll take care of it. Leave it to me." It wasn't until two days later when I understood what my dream meant. Today, I went to the Bayview Ganesha Temple (Toronto, Canada) for anointing the statues with oil. I did not want to go because I was still upset and worried over my career. However, with a little persuasion from my mother I went. This ceremony (annointing with oil or ennai-chatrathu in Tamil) is done before the maha-kumbabishekam. As I waited in line with hundreds of other devotees to annoint all the vikrams (idols), my eyes were drawn to a big tall figure located on the left side of the Ganesha idol. It was Lord Skanda! I somehow felt that I have seen this statue somewhere before. Seconds later, it finally registered in my brain! 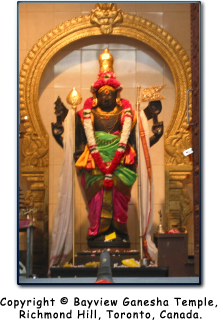 This statue of Sri Skanda in this temple was the same tall dark vikram that I saw in my dream. This statue did not have a Vel nor a Myol either! Just like the statue I saw in my dream! After I annointed Sri Ganesha, I stood in line to annoint Sri Skanda. When my turn came to annoint Lord Skanda, I repeated Sri Skanda's sacred mantra, while annointing His entire body. I remember vividly the two big feet of that huge towering statue. My family did not accompany me when I went to the temple. I went alone. So, when I walked back to the car, I cried. But this time happy tears flowed because of my reaction to Sri Skanda's Love. He knew the problems I was facing and how my heart was aching, and He responded with the dream, which was really a greeting card for me to come and get His darshan at the temple. As I went home that evening, I felt a greater sense of security, love, self-confidence, and hope because I had left my worries at His Feet. I had obeyed what my heart told me to do. Sri Skanda spoke through my heart when I awoke from my dream two days ago, to "Leave It To Me." And that is exactly what I did. Today was Thiru-Karthigai. I had a inner heart-felt call to observe this auspicious day for God Skanda. So, I did a strict fast of all my senses. I used my eyes to see good, my ears to listen to God songs, my mouth to speak sweet words, and my mind to constantly repeat Sri Skanda's sacred mantra. I went to the North-Indian Vishnu Mandir (Toronto, Canada) to get darshan of a newly installed Murugan vigraham. When I arrived there I was a little disappointed since Lord Murugan was placed outside of the temple. All the other deities were installed inside the main temple but Lord Skanda was placed outside the temple for some peculiar reason. Unhappy and insulted with this ignorant decision made by the temple administration, I decided to go visit another nearby temple, to get the darshan of Lord Skanda which I failed to get from this temple. On my way there, I was singing Arunagirinathar's Thiruppugal songs. I remember singing as I stood at the intersection of Bayview and Highway 7 to make a left turn. I was completely absorbed in singing these wonderful hymns. When I arrived at the Bayview Ganesha Temple, I was very anxious to see Murugan, as I remember the last time I came to this temple was two years ago in response to that dream I had [read above experience]. Just to look at Sri Skanda was enough to put me into tears. I was reminded of how, by His grace, the seemingly impossible feat (medical school admission) had come true. There were only a handful of devotees and one or two priests in the temple because most of the people were at work, since I went during the middle of the day. "Dear Muruga, two years later, I stand before You in tears again. This time, these tears are of joy, as I am studying medicine and preparing myself for a lifetime dedication of service in Your Name. I thank you so much for helping me come this far in my life. Through your love only am I continuing your prayers and service. At your feet do I bow." I then heard an inner call within myself to do 108-times japam on Sri Skanda's sacred mantra. So, I immediately sat down in front of the altar and repeated it 108-times with my japa malai (rosary bead necklace). When I finished doing japam, I slowly opened my eyes and saw a wonderful sight of the priest waving the katpooram aarathi to Lord Skanda. It was an amazingly perfect timing. As if Sri Skanda was hearing my japam and new precisely when I would finish. Then as I was about to circumbulate around God Skanda, the priest called me and said,"Here. Take this." He gave me a huge ripe yellow banana, some vibhuthi and flowers. I did not utter a single word since I entered the temple, and thanked God Skanda for all these benevolent acts of grace. I left some money at the altar and then drove home. As I passed the same intersection, where I previously waited when I was coming to the temple, I witnessed a three car collision. They were severely damaged and I recall seeing a father carrying his two-year old child quickly into a police vehicle. There was a traffic backup due to this accident. I thanked Sri Skanda for protecting me. It could easily have been myself as the victim of this accident. I cried upon thinking this, as it proves the case and point that God always protects His devotees who yearn for His darshan. I contemplated on this miracle all the way home. I did, however, feel bad for the unfortunate people who were involved in the accident. The next miracle came when I went to the Thiruchendur Murugan Temple in the evening. I was requested by the priest to assist in the abishekam. So, I wore a veshti and arrived on schedule for the abishekam. During the abishekam, there were two particularly touching miracles. After the priest poured vibuthi on God Skanda and waved the katpooram (camphor) deepam, the priest touched the vibuthi-covered vigraham and took some of the vibuthi and smeared it on my forehead. I was so happy because in my heart I think the greatest blessing and prasadam is not the food itself but the sacred vibhuthi that is handed to the devotees in temples. Then the priest, after pouring the chanthanam (sandlewood paste) on Murugan, also took some chanthanam and put it on my forehead. I was so thrilled and humbled by this act. I did not utter a single word other than contemplating on Sri Skanda's sacred mantra. After the abishekam (which was wonderful to watch as always), the puja commenced. During the peak of the ceremony, the priest requests four devotees to carry a vigraham of a Vel around the mulasthanam (altar). I stood patiently and awaited to see the four fortunate bhaktas who would carry Lord Skanda's mighty Vel. Amazingly enough, I was one of the chosen four. I was so happy inside as I witnessed all these small leelas of God Skanda which took place without me doing or saying anything at all. The puja was wonderful and I felt an inner peace when it concluded. This is the main reason I come to the temple, to find that inner peace that you cannot find elsewhere. Later that evening, after the puja, came the final miracle of the day. The priest shared with me his dream. He said that he and I were at Sri Narayani Amma's peedam. She was pouring manjal (tumeric) water to both the priest and me, as we sat together in the dream. She then waved a katpooram aarathi deepam to us after pouring the manjal water. I was further touched and humbled as I do not know why I, being the lowly creature that I am, was being treated in such a dignified manner.